A few weeks ago I was taking a stroll through one of our local Tuesday Morning stores when I noticed on the clearance rack a NordicWare petite popover pan (say that five times quickly). This little beauty retails for 50.00 on the Nordic Ware website but Tuesday Morning had it marked down to 25.00. Cooking ware speaks to me. This pan was calling my name. Now, I’ve never made a popover, in fact I don’t think at the time I actually knew what a popover looked or tasted like, but the pan was sweeeeeet. We invited a friend over for dinner yesterday evening. I thought I might give the popover pan a spin. Since The Spare has stomach issues, I often choose to make rather bland food which can be easily seasoned after he’s gotten his portion. I stuffed fresh rosemary and thyme from the yard into two chickens, added a fresh coating of olive oil, and put them in the oven to roast. I then quartered red potatoes, also coated them with olive oil, and threw them into the oven. Peas and a salad with some delicious Marzetti’s Simply Dressed ranch dressing rounded out the main meal. Our friend thoughtfully brought a chocolate silk pie. I should mention this is actually the second pan, the first round was removed from the pan before I could take a photo. 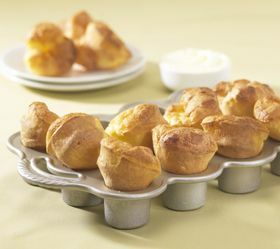 Looks just as good as the popovers from NordicWare’s website, doesn’t it! They were delicious, buttery, and very egg-y tasting. We served them with butter but I think next time I may add something sweet for a breakfast popover. Perhaps some strawberry butter. This recipe would be fantastic with a cream pipped into the middle and some chocolate. I wonder if you could throw some chocolate chunks into the batter? Preheat oven to 400 degree F. Grease pan, set aside (I forgot this part and they came out fine in the Nordic Ware pan). In a medium bowl, beat together all the ingredients. Using half the batter, fill each well 2/3 full. Bake for 20-23 minutes, until golden brown. Remove popovers from pan. Repeat filling and baking procedure with remaining batter. Don’t be surprised by the thinness of the batter. It reminded me of crepe batter. I was shocked at how puffy they became. If you let them cool, they will collapse some as the steam escapes. 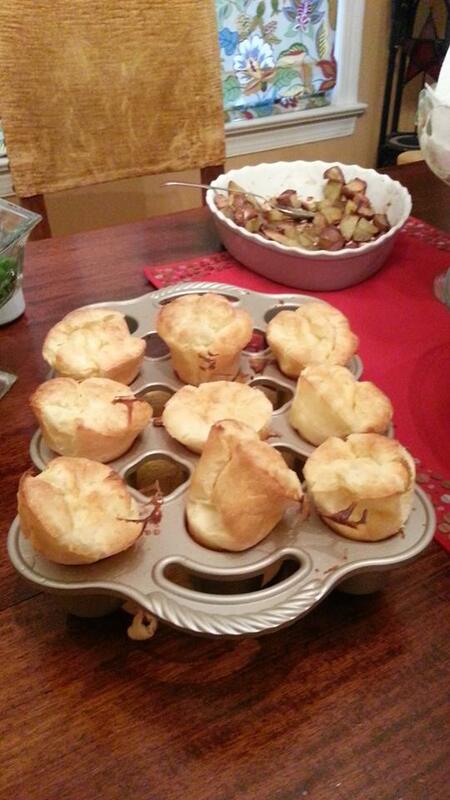 Let me know if you try this recipe, or if you’ve used larger or different popover pans. I’d like to know if anyone has used these with a savory filling? This entry was posted in Baking, NordicWare, Popovers, Sunday Dinner and tagged NordicWare, Popover. Bookmark the permalink.